Advertising a smartphone is always good for business, but when Samsung slags off iPhone users in Galaxy S2 video it takes TV ads to a whole new level. 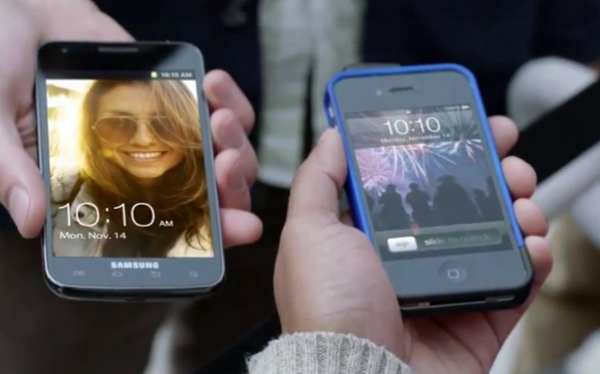 Samsung and Apple have not been on best term basis the last few months, and have had a few battles; the last case covers the big Apple accusing Sammy of copyrighting trademark design of the fruits products. Below you can see a YouTube video titled “NextBigThing 60 Final”, we have watched a few videos in our time and got to admit this one is probably the best to get up Apple’s noses, even iPhone 4S users will not find this funny. Got to admit we did laugh, this video is surely going to bring a war on between the two companies. The Verge reports that this commercial does not compare to any other when it comes to companies taking shots at each other. If you watch the video you see fanboys and girls queuing up playing on there iPhones, when they see a man holding a Samsung Galaxy SII, they hold the phones together and the iPhone users say that the Samsung smartphone is much bigger, got 4G LTE etc. We will not spoil the video, please watch it below, its epic. Please post your comments below on this one. Oh boy this is going to spark and argument or two. Wonder if Apple responds and releases a new video to slander Samsung? I love, love this commercial and my phone to (samsung).